At a family gathering last month, I was fortunate to capture my kids at their most charming. Dova has always been quite precocious when talking to adults; she speaks clearly and eloquently beyond her six years. I often forget that she is different from other kids because I see her every day. When I go away on a trip however, she amazes me the first few minutes after I come back. Talking to her is like talking to a pint-sized adult, often outspoken and amusing. She sizes up situations and puts together complicated relationships lightning fast. Nothing gets past her, nothing is ever forgotten, and she is never afraid to speak her mind. 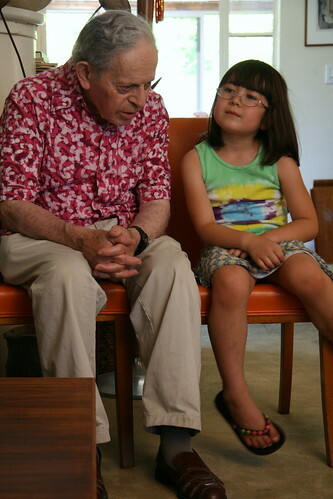 Here she is patiently and happily conversing with her 88-year-old great uncle. Adam is much more shy around people, and preferred to play with his baby cousin who turned one year old. 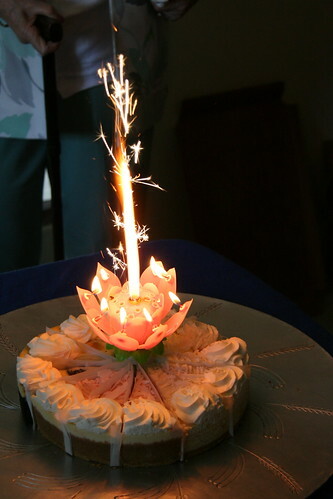 The one year old birthday girl had the special lotus flower fireworks candle on her cake. This is the first time I was able to fully capture the shooting sparks on camera. 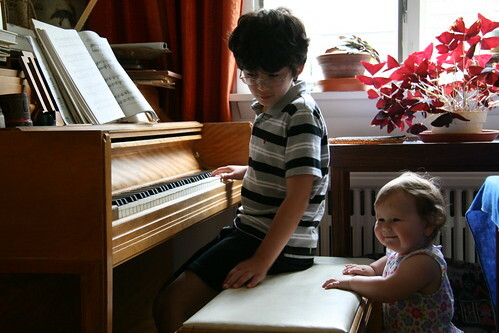 I had my hand at entertaining both my uncle and baby cousin with my piano playing as well. That is until my uncle said, "I think you should stop now, your children are jumping on the furniture." This is modus operandi at our house, but apparently they don't realize that it is not acceptable behavior in other people's homes! So much for charming kids. I am so proud of Dova. What a charming little girl, patiently entertaining a senior citizen. That's funny. My kids are always jumping on the furniture, too. Wow - where do you get such a candle? I've never seen anything like it! That candle was smuggled in from China from one of my uncle's many visits. I've seen them offered online as well.